This beautiful collection was put together by Dr. Meshginpoosh form his personal tapes recorded from various radio programs decades ago. In this album Iraj's beautiful voice shows his talent as a classical singer. There are moments of pure heaven as you will hear the magical sound of Assadollah Malek's violin and three magnificent tar masters playing solo in their own distinct style. I am grateful to Dr. Meshginpoosh for honoring my request by selecting these beautiful tracks. 1. Golhaayeh Taazeh # 5: "Taa to baa mani"
2. "Ham-e shab aah-e delam marham-e geesooy-e to bood"
5. 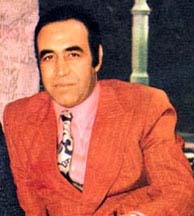 Poet Saeb's intro followed by "Gol-e parpar"
The legendary Iraj is best known for songs performed for Iranian movies. He has gone back to his roots and the result is great music. I have become his fan since he began signing classical Iranian music. This is his latest album, "Gol-e man" and his flawless voice with the beautiful background music is a real treat. When I purchased Iraj's "In Memory of Fardin" CD and just looking at its cover I knew I would be in for a wonderful surprise. Once I listened, I felt young, romantic, light as air, and so nostalgic, all at the same time. The beautiful voice of Iraj accompanied by the hypnotic sound of my forever-beloved Assadolaah Malek, in my opinion is a magnificent treasure to appreciate everyday. This album is to commemorate Fardin (feature+photos), the much beloved actor. We all remember our childhood when our parents took us to see "Ganje Gharoon" and "Soltaane Ghalbhaa". I am amazed at how many know the songs by heart. Please note that this album is produced in Iran and distributed by "Gol Avaz" in California. No phone number or website is indicated on the cover. Album: "In Memory of Fardin"